SIRANE’S thermally-insulated reusable shopping bags are a lot more environmentally-friendly than you’d perhaps realised… especially when compared with paper or cotton tote bags. The bags form part of our Earth Packaging range, a range of products that we have put together which are good for the environment: either recyclable, sustainable or compostable. 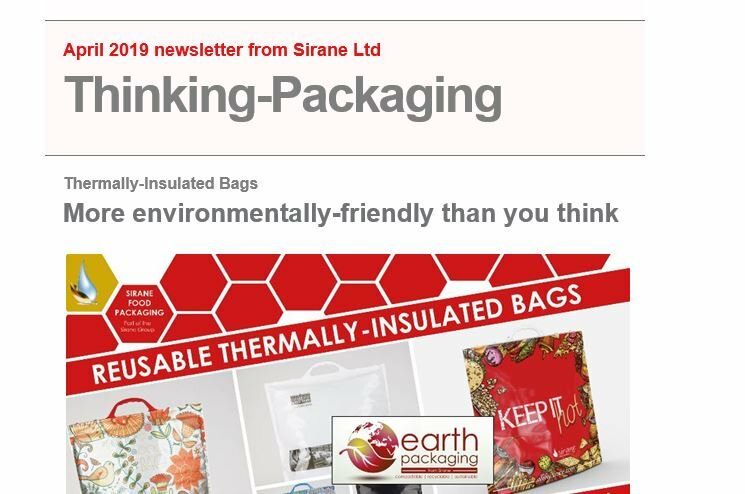 Simon Balderson, Sirane MD, said: “Thermally-insulated reusable 'bags-for-life' form part of our Earth Packaging range, which in the current climate, being a plastic bag, some people might find a bit odd… but we’ve added it to the range because we feel it is ‘green’. “It’s made from just one component, polyethylene – the handle, film and insulation are all made from polyethylene - which means it is easy to recycle. In fact, it’s the only bag of its type which has the endorsement of the UK Recycling Association. “Studies show that a paper bag would have to be used at least 4 times to have less environmental impact than a plastic bag, and for most paper bags this is almost impossible. “And compared to the popular ‘cotton tote’ bags numerous studies have shown that plastic actually has far better environmental credentials, with cotton tote bags needing to be reused thousands of times to have the same environmental impact. Clearly you can make statistics fit with any argument, but not all plastic products are inherently bad. “A 2018 study in Denmark showed that the ‘break-even point’ of a bag was 37 times for standard plastic bags, 43 times for paper bags and 7,100 times for cotton bags. But the reality is they will never be reused in anything like these levels. A UK study on climate change impact showed that polyethylene bags only needed to be reused 4 times. “It’s even possible to replace some of the virgin polyethylene with a waste sea shell product, so compared to the insulated woven PP products out there, it’s a far more eco-friendly solution. And after a long life, the bags can just be put in with the recycling. “Plastic bags also use less energy manufacture, and cause less pollution during the manufacture process, than paper. So, in this case, plastic is the best option… in the whole move to remove plastics, don’t lose sight of the fact that it may be more ‘green’. Used by supermarket shoppers and small independent food outlets alike, the thermally-insulated bags are a reusable bag ideal for transporting fresh good home, delivery services, marketing and promotion - with many people opting for their own bespoke ‘branded’ bag. Sirane’s insulated bags come with a unique handle designed to make the bags comfortable for the consumer to carry – they’re the bag your customers will reach for… which means your brand will gain visibility again and again as the customer reuses the bag. Simon Balderson, Sirane MD, said: “Whether you’re a supermarket or a farm-shop, selling fresh meat or hot-food, insulated bags could be the answer. We can custom-brand or supply with generic print, and digitally printing allows for shorter print runs. The ‘danger zone’ for food is between 15OC and 50OC, during which rapid microbial growth takes place - and keeping food away from this temperature zone can prevent food-borne illnesses. However, re-usable bags themselves can also become carriers of harmful bacteria, so an integrated anti-bacterial technology protects against bacteria build-up. “No-one really considers the health implications of re-using shopping bags,” added Simon. “but scientific studies show bacteria build-up can be potentially harmful, and that there’s often as much bacteria on the outside of meat packaging as on the inside. There’s advice out there that people should wash bags-for-life, but how many people do this? “Anti-bacterial thermally-insulated bags stop customers having to even worry about this – it doesn’t matter how many times they re-use the bag, they are protected. Both off-the-shelf (available to buy now, from https://shop.sirane.com) and custom-printed versions of the bag are available, and there are a range of potential sizes offered, including bags small enough to be lunch-bags. Our Earth Packaging range includes paper-based absorbent pads, plastic-free packaging solutions including pouches/films/bags for dry and moist foods with a range of barriers, compostable bags and films, compostable plant pots and more. SIRANE’S pouch-filling line and our plastic-free packaging were undoubtedly the major talking points on our stand at the Farm-Shop and Deli Show 2019. The multi award-winning packaging solution proved hugely popular at Packaging Innovations earlier in the year – and it was no different at this show. Mark Lingard, Marketing Manager, said: “Plastic-free packaging was certainly the star of the show for us at the Farm-Shop and Deli Show. Public pressure has forced customers big and small to look for ways to remove plastic wherever possible. “The fact that we are also able to offer a complete solution, including a high-speed, low-cost pouch-filling line that runs with the Earthpouch was also of significant interest with a number of visitors to the stand asking for a demonstration. Perfect for a range of dry and moist products – including granolas, porridge oats, grains, health/diet supplements and more, the Earthpouch is a paper-based solution with a heat-sealable coating, which is preformed into a stand-up pouch. Since launching the product last year, we’ve added barrier and high-barrier versions. Simon Balderson, Sirane MD, said: “Earthpouch is a plastic-free solution, a paper-based material with a plastic-free coating which is perfect for a range of products. One of the questions we’re often asked is ‘how do I fill the pouch?’ Visitors to the stand were able to see the pouch-filling line, the M7, which is compatible with the Earthpouch – and offers an affordable way to scale-up production. Simon Balderson added: “It’s a fast, versatile and low-cost option, with lines starting from just £35,000. Single and twin-head machines are available, and they are simple to operate. They also have a small footprint, so are perfect for this sector. Sirane’s online store, with a range of products perfect for over-the-counter use in farm-shops and butchers etc. was also exhibited at the show. We launched a new online store in late 2018 offering some of our more popular products including cooking bags, flower packaging and insulated bags. Sirane’s award-winning plastic-free packaging ‘Earthpouch’ has also been listed in the web-store and is available to order now in three standard sizes. Simon Balderson, Sirane managing director, said: “Sirane’s new online store will fill a gap by allowing customers looking for smaller quantities to order online. “We’ve also just added the Earthpouch, initially in three standard sizes, and this was following numerous requests from customers looking to order plain pouches. The online offering is a barrier version, plain white – perfect for a range of products and ideal for any smaller business looking for eco-friendly packaging. The Farm Shop & Deli Show ran at the NEC, Birmingham, from April 8-10, 2019. For more information on our shop, or to buy now, visit http://shop.sirane.com. No accounts are needed, and free delivery for commercial orders is from just £100.